Given Nomad, one of Sydney's newest breweries, is a joint venture between Italians Birra del Borgo and importer / distributor Experienceit there's a broad palette of ready made, in-house collaborators to pick from. 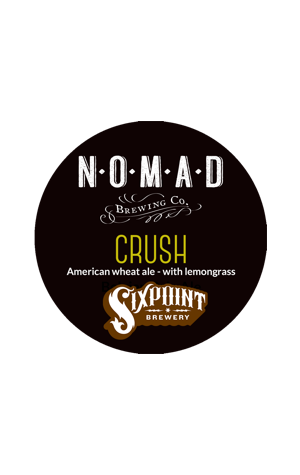 During 2014's Sydney Craft Beer Week, one of Experienceit's American buddies, Sixpoint, called into the Northern Beaches brewery and got to work with head brewer Brooks Caretta on this American Wheat. American wheat ales use wheat (obviously) alongside barley in the mix but alongside a pretty straightforward and clean American yeast so there's none of the banana, clove or other fruits and spices typical in Belgian or German wheat / wit beers. What they're often used for is as a showcase for hops and, with Sixpoint's Shane Welch a fan of using hops (lots of them) that's what happened here with Australian Cascade and Galaxy the varieties of choice. Some native lemongrass was also added another layer of citrus to the mix. Apparently the choice of name was obvious; "Shane seemed to use the word in EVERY sentence," says the brewery's Capo. It's appropriate in another way as the beer – in body and flavour – is rather juicy too.